In some ways, this seems like just another story of teen pregnancy. It's good, and it's absorbing -- the writing pulled me in so that I checked it out rather than shelving it at the library, and then kept me reading until early morning -- but in some places the dialog and situations felt stilted and stereotypical. A teen pregnancy novel is a hard one to write. Because the situation itself involves thousands of teens, but a novel must focus on one particular teen. What happens to that one teen will feel symbolic of what happens to the other teens in that situation, and that's a bigger burden than a young adult novel can necessarily carry. 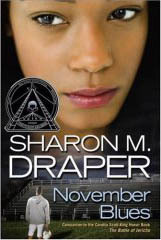 November has to choose between keeping her baby and giving the baby up to her dead boyfriend's rich parents. I found myself wanting to shake them and say, "Isn't there an alternative? Can't you let November keep the baby, but provide her support and be a huge part of your grandchild's life? Does it have to be all or nothing?" Again, this was one particular story, but the situation felt so prototypical, I found myself wanting the author to present all possibilities, more than I would have cared in a novel about, say, choosing between a career in art or science.